Willard Parr, left, is pictured with longtime co-workers Herb Day, center, and John Barney during a roast and tribute Thursday to his 62-plus-year career in local radio broadcasting. 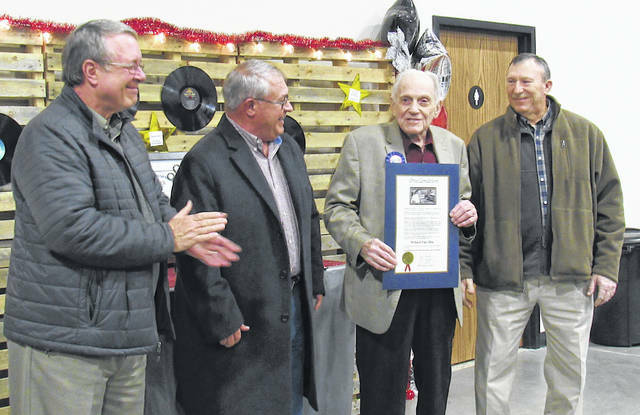 The Highland County Board of Commissioners proclaimed Dec. 6, 2018 as Willard Parr Day in Highland County during an event Thursday in Parr’s honor. Pictured, from left, are Commissioners Gary Abernathy and Jeff Duncan, Parr, and Commissioner Terry Britton. 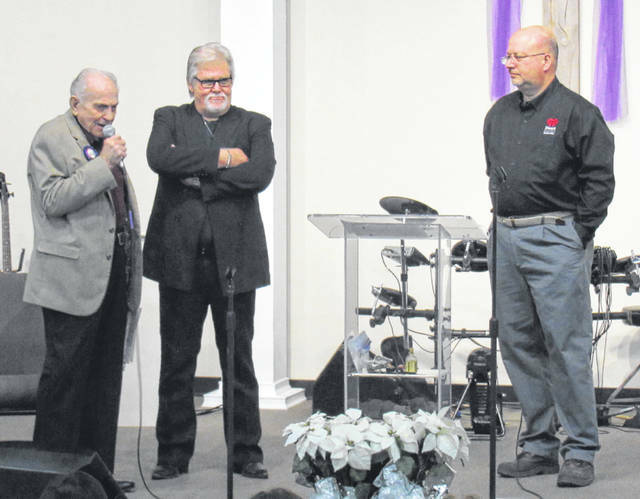 Longtime WSRW Radio personality Willard Parr was praised and roasted Thursday evening during a reception that found nearly 300 people filing in and out of the Southside Praise and Worship Center in Hillsboro. Parr greeted well-wishers during the two-hour long event that featured everything from jokes to reflections of a career in local broadcast history that spanned more than six decades. Parr’s deep, rich dulcet tones awakened southern Ohio listeners on WSRW 1590 AM and 50,000-watt powerhouse WSRW-FM 106.7 for the lifetime of most of the people in attendance Thursday. At one point, Dee Brown, wife of Southside Pastor Mike Brown, asked that Parr announce school closings on the microphone for old-time’s sake just once more, to which he obliged to the pleasure of the crowd. The Highland County Commissioners proclaimed Thursday, Dec. 6 “Willard Parr Day” in Highland County, and Commissioner Jeff Duncan read the proclamation to Parr and onlookers. Steve Haag, Jane Tissot, Dayne “Whoop Whoop” Puckett, Tom Archibald Jr., IHeart Media Sales Manager John Barney as well as others shared funny and occasional heart-warming stories as they chronicled their life experiences with Willard Parr. Also in attendance to support the celebration were I-Heart Media Market Manager Josh Koch, Christina Wolford, Mike Smith and Bryce Matson. Longtime radio partner Herb Day, who served as emcee, spoke of some of the adventures the two shared as Parr helped get Day’s career started back in the 1970s. When Parr took the microphone, he thanked all who listened to him down through the years, and the 93-year-old Hall of Fame inductee thanked God and gave Him the glory for making his long and fruitful career possible. Parr began his radio career in the summer of 1956 as WSRW AM 1590 was being built and remained continuously on the air until Oct. 31, 2018. In the next chapter of his life, Parr plans to move to Phenix, Ala. with his daughter, Karen, and her husband, Rick, in the next couple of weeks and enjoy a calmer climate. Food and decorations for the reception were provided by the ladies and men of Southside Praise & Worship Center, headed up by Rhonda Storer, and the event was sponsored by Southside Praise & Worship Center, IHeart Media and Herb Day Voices-HEKA Media.